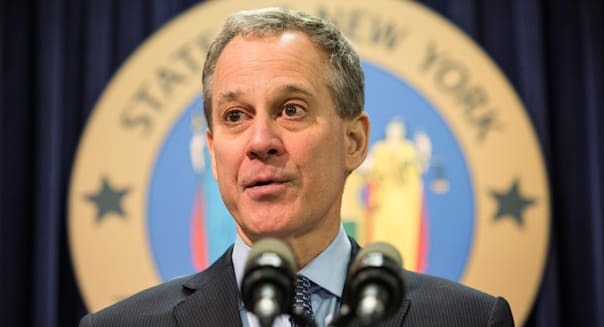 Five attorneys general joined forces and filed lawsuits intended to shut down a massive alleged newspaper and magazine subscription scam that solicited millions of consumers nationwide, officials announced Tuesday. Solicitations pitching "one of the lowest available rates" or renewals when none were due were sent out by a collection of companies that charged as much as double the publication price, New York's Attorney General Office said. The notices -- appearing to be from the publications themselves -- were sent without the permission of the publishers and the solicitors allegedly pocketed the overcharges. %VIRTUAL-pullquote-This sophisticated mail scam ripped off thousands of Oregonians and others across the country.%In addition to New York, attorneys general from Oregon, Minnesota, Missouri and Texas also are involved. Consumers who realized they were being taken advantage of began complaining, leading several to launch their own campaigns to get the solicitations to stop. Dow Jones, publisher of The Wall Street Journal, estimated that it spent $3.5 million to try to combat the subscription pitches. Thousands of consumer complaints were documented by government agencies and the Better Business Bureau. Many consumers complained that they had paid for subscriptions or renewals but never received them. "This sophisticated mail scam ripped off thousands of Oregonians and others across the country," Oregon Attorney General Ellen Rosenblum said. "Consumers thought they were dealing with legitimate companies, and that they were paying the lowest available price. Instead, they sent payments to a dishonest third-party, who pocketed the money." Return addresses from the subscription services were usually from Nevada or Oregon, and officials said so many different names were used to spread out the number of complaints to delay detection. Subscriptions were sold to at least 44 different publications. Among the publications considered to be "victimized" in this case are Consumer Reports, Woman's World, National Geographic, Forbes, The New York Times, The Wall Street Journal, The Washington Post and Sports Illustrated. Examples of the overcharge cited include $59.95 a year for Consumer Reports, which actually costs $29.95, and $600 a year of The Wall Street Journal -- a subscription that regularly sells for $413. The states filed lawsuits against Orbital Publishing Group Inc. and collection of related companies believed to be part of the alleged scam. They sold subscriptions under these names: Magazine Payment Services, Associated Publishers Network, Publishers Periodical Service, United Publishers Service, Publishers Billing Exchange, Publishers Billing Association, Publishers Billing Center, Magazine Billing Network, Publishers Distribution Services, Magazine Distribution Service and Subscription Billing Service. Those named in the lawsuits include: Liberty Publishers Service Inc., Express Publishers Service Inc., Associated Publishers Network Inc., Publishers Payment Processing Inc., Adept Management Inc., Customer Access Services Inc., Consolidated Publishers Exchange Inc., Magazine Clearing Exchange Inc., Henry Cricket Group , Laura Lovrien and Lydia Pugsley. Laura Lovrien is reportedly chief operating officer of Orbital and the president of Liberty Publishers. Pugsley is said to be owner of Adept Management.